Well, Sunday was a free day since we came home early from the tour. It was an incredible 60 degrees in the Twin Cities in the morning, so what should I do with that free time--finish up an article that's due Monday for a friend who will be nameless or go birding...hmmm...birding....article...which to choose? I ended up at the Minnesota Valley NWR. Oooooooo. Ahhhhhhhh. 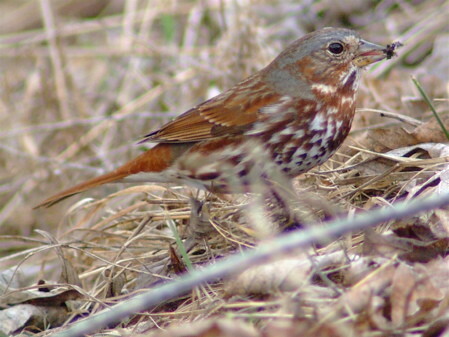 I love the above photo of the fox sparrow with the tiny morsel of food with a bit of dirt in its bill. How do these guys find anything edible? There were at least six sparrows mixed in with a huge flock of juncos. All were a bit cagey, but after me standing still for a bit, got used to my presence. The fox sparrows were constantly kicking with their feet to move the leaves and other natural debris to get a s tasty seeds beneath. 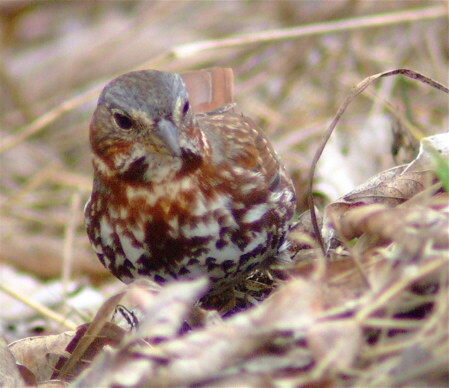 For a brown bird, these sparrows really are very pretty and very striking. Well, I better get to work on finishing that article due Monday.